Bill Davidson was granted two US Patents for creating business intelligence, business standards and reusable knowledge for channel and alliance selection, agreement creation and partnering management that works as a fully integrated leading edge analytics and predictive score carding tool. 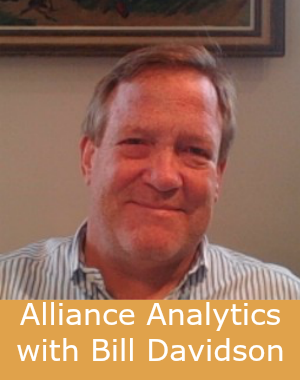 Bill is the CEO and founder of Alliance Analytics Software, Inc and in this episode of the Collaborative Business Podcast we explore what his alliance analytics software can do for alliances. Software that calculates the actual, numeric value for each of a company’s partnerships and generates analytics and insights that can be used to adjust and make changes to a company’s current year partnering programs. This altogether spiked my interest to have Bill on the show and to find out how his software is helping out in the area of partner selection and alliance management. Tune into the video – or audio – conversation and find out! Is your communication a one-way street?